A digital advertising company that provides hospitality solutions through an interactive touchscreen concierge service, Porter24 launched in San Diego this past year and implemented its content management system (CMS) in hotels across the city. Expanding markets in upcoming months, the Porter24 system boasts a unique set of features on interactive touchscreens that provide a digital solution to user’s needs. Free for hotels across the country, Porter24’s content management system (CMS) allows hotels to customize and update in real-time, allowing users to find local business deals, tourist attractions, local weather, track flights and see additional offerings on the hotel they are staying at. 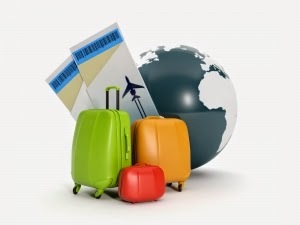 Check out the list of popular summer travel and hospitality technologies below. Swap plastic keycards (you know, the ones we always seem to lose) for Bluetooth technology with the SPG Keyless by Starwood. Download the app and with the simple wave of your smartphone unlock your hotel room. In addition to the keyless feature, the app also offers mobile check in. Bypass the check in counter entirely and do it all from the comfort of your mobile device. Phone battery problems? Get in line. With the proliferation of wireless technologies that we pack along with us during a vacation these days, there’s bound to be a need for charging technologies. Kube Systems has you covered with the KS Portable. The multi-device charger boasts a cool wireless drop and charge capability - simply place your phone on top of the KS Portable and voila, the battery starts to charge. You can charge your phone on top of the portable device while also connecting other wireless technologies to one of many outlets on the Kube; compatible with both iPhone, Android and Windows devices. Now your mirror can provide dual functionality. Electric Mirror produces mirrors that serve as TVs! Do your makeup in it and watch the news at the same time. Technology is seamlessly integrated into decadent vanity mirrors, transforming the conventional into awesome. Enjoy a bath or a shave while also watching your favorite show. Some are even waterproof and Bluetooth enabled. With the simple touch of a power button transform your cellular connection into your own personal Wi-Fi. Sure there are other devices like this out on the market but the Karma Go is sleek, slender and offers its service for up to eight devices at once. The Karma is priced at $149 and there are no monthly fees or contracts, just buy data as you go ($14 per 1GB). Prepaid wireless hotspots are in people, get with the times. Everyone travels for business. Integrate technology into your wardrobe with cufflinks that serve as flash drives. Simply undo the cufflink, plug it into your laptop and access your files instantly. With the Ravi Ratan cufflinks you feel like a traveling 007 businessman. We’ve all lost some luggage along the course of our travels. And we all know what a headache it can be. With the palm sized Trakdot Luggage Tracker, you can eliminate the worry associated with your luggage and finally gain some piece of mind. Simply drop the device among the items in your suitcase and use your phone to track it. Once you arrive, Trakdot will send a text message or email, confirming your luggage has arrived with you. This is a guest post. Thank you Daniel Ramirez, Vice President of Porter24 for sharing this information with my travel blog readers. I was not aware of most of,these technologies and some of them make me think of a sci-fi movie, especially the cuff links that can also be flash drives.